One of the most remarkable aspects of the Armstrong Browning Library building is its sixty-two stained glass windows, believed to be the largest collection of secular stained glass in the world. These brilliantly hued, inspirational windows illustrate the poetry of Robert and Elizabeth Barrett Browning in a stunning medium of light and color. The Language of Stained Glass provides a guide to the symbolism of the colors. 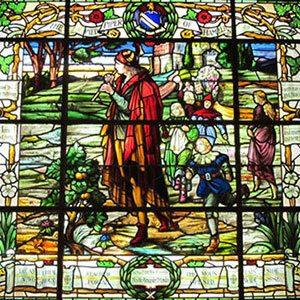 Forty-seven of the windows represent themes from Robert Browning's poetry, while eight are based on Elizabeth Barrett Browning's well-known Sonnets from the Portuguese, and four of the newest windows contain lines from both poets. These beautiful windows are featured on all three floors of the building. Using the links at the right, please take a moment to browse this unique collection of stained glass. Three striking cathedral windows in the McLean Foyer of Meditation, very different from the pictorial style throughout the rest of the building, transmit a feeling of sunrise or sunset as the shades of glass vary from deep amber to pale lavender. A section of one of these windows appears at the right. The three oldest windows in the building, dating to 1924 and originally installed in the Browning Room of Carroll Library, were designed by Haskins Glass Studio, Rochester, New York. The majority of the windows, commissioned in the late 1940s and early 1950s as the main floor of the building was being planned and constructed, were created by Charles J. Connick Associates, Inc., Boston, Massachusetts, and by Jacoby Art Glass Company, Saint Louis, Missouri. Eight more Connick windows were added in the 1960s and 1970s. Three of these windows completed the span of stained glass across the front of the building on the third floor, while the other five enhanced the southwest corner. In the 1980s, the remaining five window spaces on the northeast corner of the third floor were filled with stained glass, the work of Charles J. Connick Associates, Inc., Lynn Hovey Studio, Inc., Cambridge, Massachusetts, and L. L. Sams Stained Glass, Waco, Texas. The newest windows, installed between 2000 and 2007, were created by Willet Hauser Architectural Glass, Philadelphia, Pennsylvania, formerly Willet Stained Glass Studios. These six colorful windows grace the first floor entrance and depict Italian scenes significant to the Brownings. The completion of the Italy and the Brownings project on the first floor of the building essentially closes the chapter on stained glass at the Armstrong Browning Library.